File image: developer Anthony Stewart at 2018 announcement. 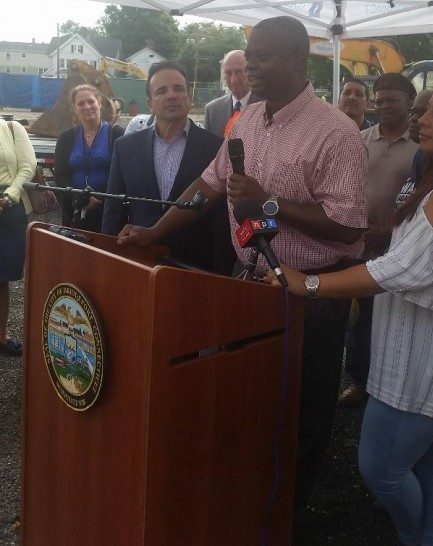 Anthony Stewart, managing partner of city-based Ashlar Construction, has joined forces with Bridgeport Landing Development, operators of the Steelpointe Harbor redevelopment area, as equity partners for a $7 million investment in the East End that will include a Gala Foods grocery store. Groundbreaking is expected in July. First there was the announcement. Then the announcement that there would be a delay. Then this announcement about the delay. Then there will be an announcement that he is Bill Stewards brother who used to work in the mayor’s office. Then there be another delay. Ad infinitum. Enough already. No more press until it actually opens, OK???? So Bob, Anthony Stewart and Bill Stewart are brothers, interesting, by the way what happen to Bill Stewart? Ron Mackey, I doubt Bob Walsh knows what happened to Bill Stewart. Ernie Newton most likely can answer that question. It’s indeed interesting and if true, even more interesting as the Ashlar Construction website only shows 2 other Stewart’s; a brief mention of the father; no mention of Bill Stewart. Lennie, what’s the meaning of a silent partner? Bob Walsh, ( Jeff kohut, feel free to jump in) you’re an accountant and as such the best person to ask this question: What’ the definition of equity partners? How does this type of partnership works (pros ans cons)? Can there be silent partners in equity partnerships? In case you miss the connection, 277 Fairfield Avenue is the location of Phil Kutchma Corporation. Joel, interesting, is that the silent partner of a minority own company? Let me state for the record Mr. Steward Grow up in the Eastend of Bridgeport. His family lived on Davenport st. His Brothers and Sisters went to Newfield, McKinley, Lincoln ,East Middle , and Warren Harding H.S and Bill steward is not his brother they are related. MR. Stewart is probably the first major Black developer from Bridgeport to do a major project in this city. I want to thank the NRZ, Our Council Persons and Community because we are finally seeing changes with the civic block. Ron he is not a silent t partner. Our Library is on track and our ground breaking for the civic block is on track. Mr. Stewart put his on money behind this Project. Please stop with the conspiracies. You all have no idea what you are talking about. Ernie, it;s called fact checking and transparency, you think that the information that you provided Ernie would have been made known to the public and it would be a good selling point and give a sense of pride to the East End but I’ve never seen the information. “MR. Stewart is probably the first major Black developer from Bridgeport to do a major project in this city”. Ernie, save that for the next Black History Month. You don’t get it! Any time there are business relationship and connections between friends and government, there will be questions and concerns raised. The federal probe of Tiago and apparently of th e Police Chief apappointment are just two recent examples. Since when is having been raised in a certain neighborhood a necessary criteria for selection as a developer for a government project? I, like many other folks have never heard of Ashlar Construction; haven’t seen trucks, vans or equipment with identifying logos of Ashlar Construction; the office at 277 Fairfield Avenue is the same as Phil Kuchma Corporation with a history of questionable business deals with the City of Bridgeport. The City of Bridgeport took control of the Library construction from the Bridgeport Library Board. Ashlar is selected as the developer for the Library Project for $6 million in addition to the next commercial phase. It’s obvious to us that Ashlar Construction is not a silent partner and has an equity partnership with the steel pointe developer. Equity partnerships can be complex and risky especially when mixed with public dollars. Ashlar Construction hasn’t opened their books to you for you to say they have put up their own money. They’re most likely putting the profits from the Library construction towards the next phase. The city is going to take control of the 9 parcels needed for the project one way or the other and turn it over to the equity partners at a public cost yet to be determined. These are not conspiracy theories and I do know what I’m talking about. Perhaps in the past the Stewarts had a connection to the neighborhood and left for whatever reasons. Why not set-up an office or base in the neighborhood (East End) instead of in downtown at Kutchma’s property? First of all you don’t know what you are talking about. Once the civic Block is completed Mr. Stewart will move his headquarter to the EastEnd. Secondly Ashlar Construction has put up his own money for this project. The reason Steelpoint developers are equity partner is because they put up one million dollars to help with housing, senior housing, and homeownership, and rental units. Every developer who comes to Bridgeport has looked for something (Taxes abatements). I don;t know Mr. Stewart relationship with Mr. Kuchma other then renting space from him. The East End is Happy to have someone of Mr. Stewart Vision and Dreams to bring the east end back to its glory days when we grow up in a community that had everything it needed. Banks, pharmacy Gas station grocery stores etc. Mr. Stewart shares thoughts same dreams. It was to the NRZ and to the stake owners in the EastEnd. We all support Mr. Stewart because he listened to what the community wanted and that he had roots in the community. We have had a lot of Black developers get projects but never one who grow up here in our community. Ron Mr. Stewart has been the first developer to hire community people and community contractors. please be proud of the fact Eastend is on the Move. Ernie, again, my concern is you think that the information that you provided Ernie would have been made known to the public and it would be a good selling point and give a sense of pride to the East End but I’ve never seen the information. I would think that Mayor Ganim, the City Council member from the 139th would be celebrating Anthony Stewart being from the East End but it’s only mention because there were questioning Anthony Stewart relationship to Bill Stewart. There are a number of us who have a view of ongoing City activity that mixes money, land and the construction of real estate that hopefully will be worth what it cost to build and will become a full taxpayer as many of us are. It cannot happen too soon. And I have been connected with the NRZ in Black ROck since its onset when we also incorporated and elected 501c3 status. Within the past six weeks I made a comment about the most recent property taken in at Steelpoint-BLD which had a history as a manufacturing site in the late 20th Century but was raw land in need of serious remediation while Ganim1 was Mayor. A late 90’s letter warned Ganim not to pay more than 2.5 Million for the land, but obviously he knew better and came up with $7 Million additional. So the City owned said property (more or less) with a base of $10 Million. Then they fed in another $6-7Million to improve and sold it in the last 12-18 months for$10.6 Million. Selling something for less than it cost you is not a great way to show how smart you are, is it? Making a full breast confession with remorse might be suggested by some as necessary. Aside from not producing tax revenues for 15 years or more, again the City would appear to have paid more for its purchase than it was worth in the marketplace. What does that habit do to marketplace values, Tom Gill? Wasn’t the food store of this size supposed to be complete before the transfer of property? Any financial reports for the past ten years of Port Authority activity that are available yet to the Bridgeport taxpaying public? How do we manage to do this to ourselves?? Is it the threats of eminent domain, etc.? Why can’t we look at the numbers to see trends and hold leadership responsible for poor trends? Look at the numbers, first. What story is told? Look at the process of development in terms of speed? ASHLAR did an impressive job with refashioning the space on East Main to its current use and it is in use. Visit it as I have several times to see how appreciated it is by patrons. And shouldn’t we take pride in the fact that some individuals can and do use their skills, region wide profitably, and still have time, resources and spirit to help their hometown?? I am personally in favor of seeing long term local folks as part of investors in redevelopment not the least because they have withstood patiently the lack of productive property use. Where are the creative ways to include the community directly into these “deals”? How many City purchases that later sell for less (and often lots less) have to show up to indicate that the City does not have the talent for such work? Time will tell. Ashlar Construction LLC is a foreign limited liability corporation formed in New York State in 2015. Anthony Stewart is managing partner. Mr. Stewart resides in Ridgefield. Tom White…what does that mean? Can you interpret that for all of us who are not accountants or legal eagles? Thank you. A limited liability company (LLC) is a corporate structure in the United States whereby the owners are not personally liable for the company’s debts or liabilities. Limited liability companies are hybrid entities that combine the characteristics of a corporation with those of a partnership or sole proprietorship. Connecticut allows LLCs formed in another state to file as ‘Foreign LLC’. Mr Stewart and others use this approach so they can have the flexibility of a partnership but with limited liability so their personal assets are not touched in case the business fails or they are sued for non-performance. My comment about ‘window dressing’ is my sarcasm. This is how a contract can be classified as a minority vendor. Maybe Ernie and the city council will conduct thorough research and clarify their apparent enthusiasm regarding Ashlar.